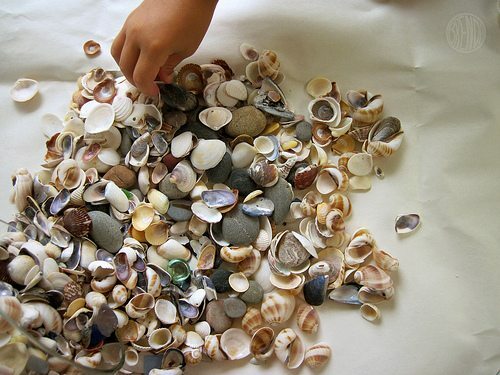 Have you ever come home from vacation with a collection of shells you don’t know what to do with? Maybe you live at the beach like we do and somehow find yourself coming home with them in your pockets even when you try not to. It’s easy to do. They are so pretty and beg to be collected. However it can sometimes be challenging to know what to do with them once you get them home. We say gift them as art! We decided to kick it up a notch with our shells this month and gave them a light color wash with acrylic paint (the safest option is water-based children’s paint). It’s not that they aren’t beautiful already in their natural state it was just something fun to do to while away an otherwise long boring summer afternoon. If you are looking for a way to keep your kids occupied, this is it. My daughter spent hours daintily painting shell after shell. By the end of the afternoon we had quite a collection! We also had some really pretty butcher paper that I intend to recycle into greeting cards later (but that’s another post). If you do this, save your paper! It makes great wrapping paper. After all the shells were painted we let them dry for a day. Then we took our whole collection of painted and unpainted shells on a play date and let our friends have fun with them too. I set out the shells, some paint mixed with water and some white Elmer’s glue to paint with too. Most of the kids made collages, some made flowers and some wanted to paint more shells! I told you it was a kid-captivator! Funny how that works. I wasn’t quite done with this craft yet. 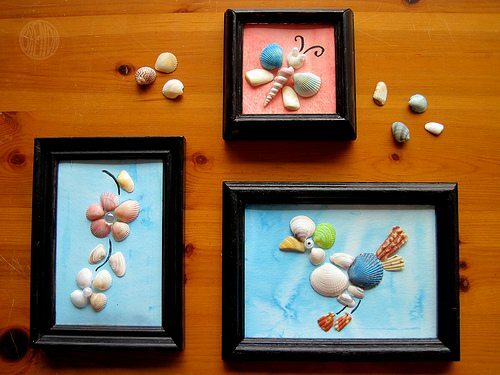 I wanted to see the shell art framed. 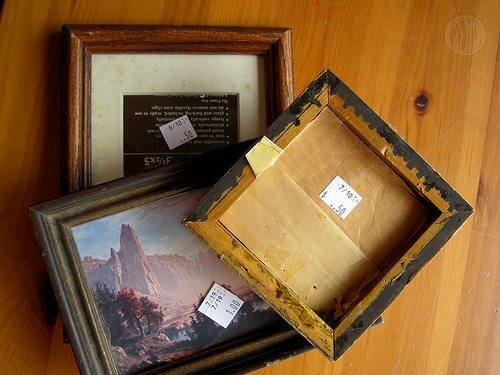 We found some cheap thrift store frames and painted them black (again, water-based children’s paint is the safest option). 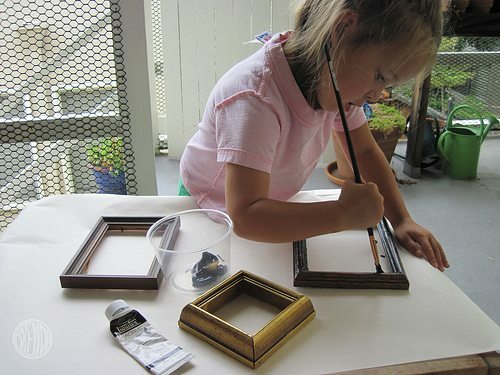 Inside-out shirts make great painting smocks too when you don’t want to completely ruin your clothes. I used some more watered-down acrylic paint, and gently painted some sheets of watercolor paper cut to fit the frames. Then I broke out the glue-gun (unlike the kids I didn’t really like the sticky white glue much. Glue guns should only be used by responsible adults) and had a go at making my own collage. 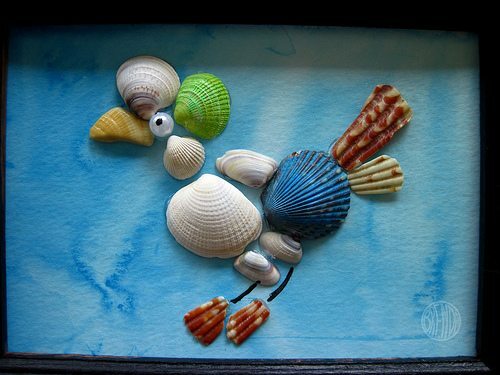 The kids made beach scenes and flowers but I had a chicken in mind. With a pearl for an eye, he came together. A few strokes of black for his legs and he was done! Then I popped him and some others into their frames and voila! ART! Now to find somebody to gift these to…. I love this! Just wish we were close enough to a beach to gather shells!!! Gonna make these! Perfect for the lake! However the shells will come from the dollar store since all we have at the lake is cray fish shells and the occasional clam shell. My mom would love the chicken. I wish we lived somewhere that we could easily collect shells 🙁 at least Michaels sells big bags of them! 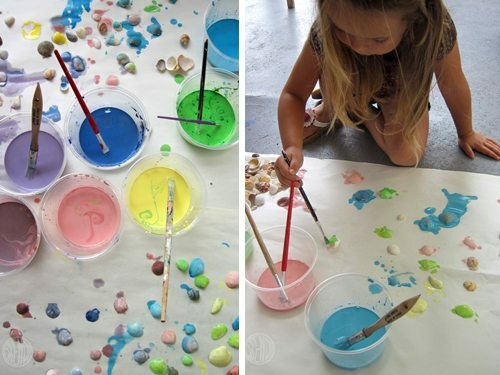 Great craft, can’t wait to do this with my daughter! These are cute! 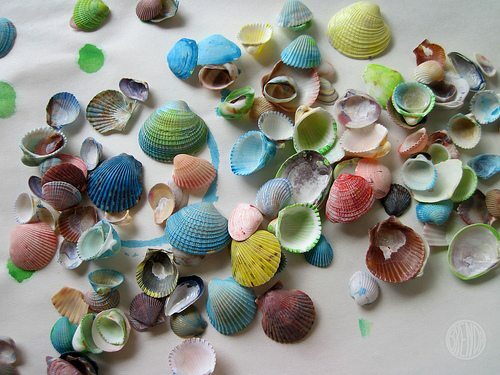 I love the idea of painting the shells. I especially like the butterfly. 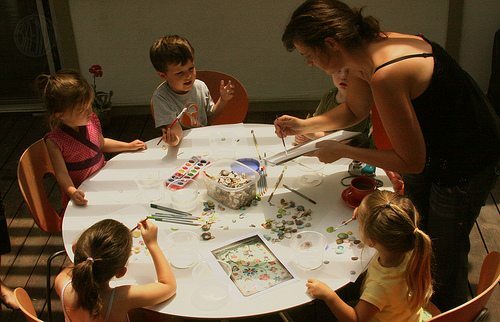 Brenda–so when you had Bug paint them the first day, you used acrylic paint but did you water the acrylic paint down like you said you did later with the paper? 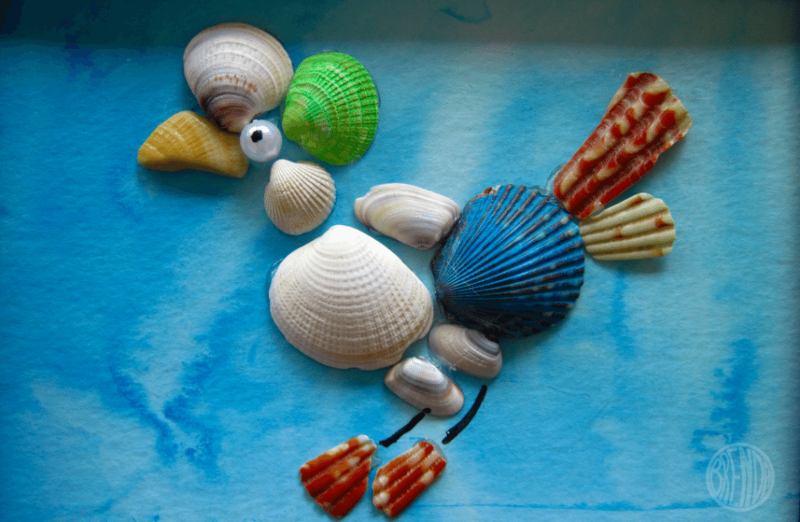 And then you have watercolors in another photo–does that work on the shells or not as well? I am so excited to find this craft as my daughter’s mermaid-themed bday party is next week and I think this will fit in perfectly! Just trying to decide on the least messy solution so we don’t ruin everyone’s clothes. Thanks!! I just tried to leave a comment but I don’t think it took–sorry if this ends up being a duplication. 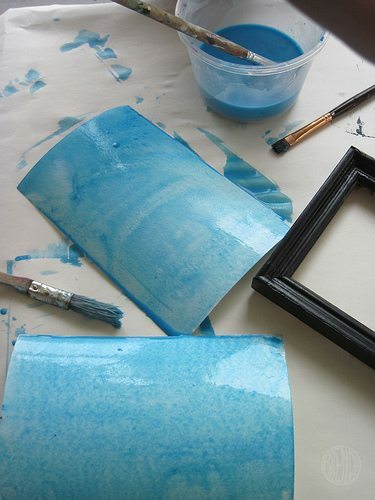 I was just wondering–did you use watered down acrylic to paint the shells (as you said you did with the paper)? And I see you have watercolors in another photo–did that work as well on the shells or were you using that for something else? My daughter’s mermaid-themed bday party is next week and this will fit in perfectly! Thanks so much for the great idea! SOOOOO cute. I love this. But now I just need to find buckets and buckets of shells. When I come to Cali again, I’m going to ask you what beach to hit up!! I did both. Personally, I think the watered-down acrylic worked much better. If you water it down enough it’s pretty easy to clean up just make sure everyone is mindful to wash out any splashes that get on clothes. This will be super fun for a mermaid party! How fun! Thanks again, Brenda. I don’t think Matilda got out of her chair for over an hour. We’re off to collect shells this week for sure. This is SO awesome idea!!!!!!! Thank you!!!! 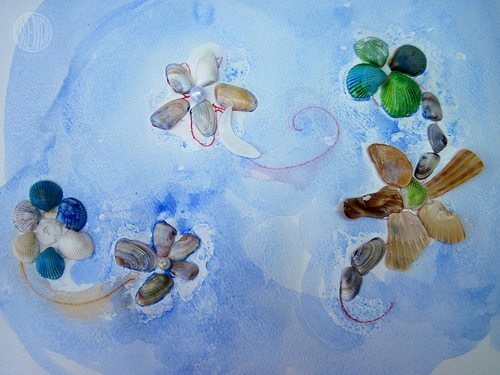 I really found this sea shell art activity on this site very interesting and captivating…thanks a lot Branda…. Its a good thing to connect and make use of something lying idle at your pace…. 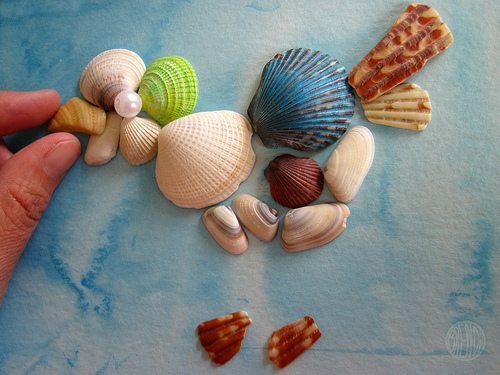 Shell Painting Creates Beautiful Ocean Art for Kids - Fun-A-Day!